After doing "Trooper on the Train" / Operation Lifesaver work between Salt Lake and Provo throughout the last week, UP 1989 has been released to come home to Colorado. It was spotted as the trailing unit (but facing east) on Sunday's MROPV-29, the Roper to Provo manifest. Speculation is that it will likely go east on Monday's MPVNY-30, the new Provo-North Yard manifests. We can only hope it'll be on the point. I should make a note that the MPVNY/MNYPV have replaced the previous MRONY/MNYRO pair. They're now originating from the refurbished Rio Grande yard in Provo, rather than coming down all the way from the ex-D&RGW Roper Yard in Salt Lake City. (Update 10/30 - 0825h): Here it comes! 1989 left Provo eastbound at 0655h this morning towards Denver. It'll probably have a fairly lengthy stopover in Grand Junction, as the MRONY used to do. Just got a note from Tyler saying that, unfortunately, it's the fourth unit back, behind 3 SD70Ms. Good luck - looks like a beautiful day out there! The Towner Line was sold by the State of Colorado to the V&S Railway in mid-December 2005, after the Colorado Kansas & Pacific ceased operations earlier that year. Since today very well might be the last day of convertible weather I get this year, I decided to go for a little drive along the route and check out what this new operator has been up to. 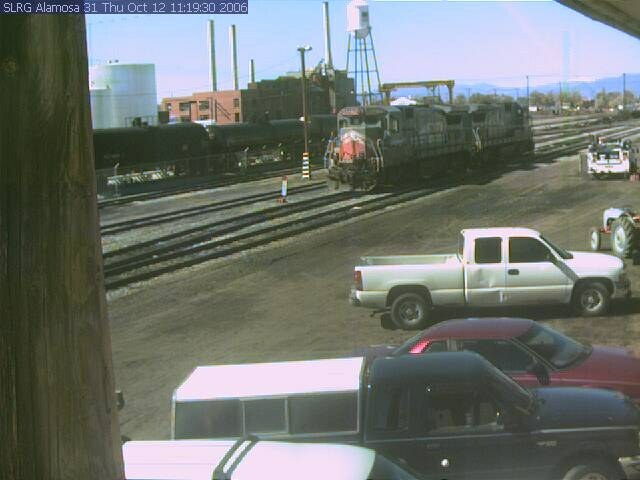 As of today (Sunday, 29-Oct-2006), I found their two locomotives tied down in Eads, CO. Both were shut down, and I would have to assume drained, since there was no indication of an auto-start system and temperatures at night have been below freezing lately. Wheel treads on both units were mildly rusty - clearly they had been run, but not much recently. I find their B30-7AB (the cabless booster) to be a very strange choice for a railroad with no turning facilities (and no traffic that would require more than the 242 could handle). 4066 is completely useless without 242 to lead, so it's not like they wanted a spare unit in case one failed. The only cars on the entire line from NA Jct. to the Kansas border were just west of NA Junction - four flatcars and one five-unit spine car. They'd been there for some time, as all the wheels were well-rusted. Periodic spot-checks of the rail head and flangeways at crossings along the entire line showed no sign of recent activity. It doesn't look good for the Towner Line's future - for a railroad that has such great car-parking potential (as the CK&P showed), they aren't even using it for that. It's just... empty. Last Saturday, the Cumbres & Toltec Scenic hosted Chama Steam V, a single day charter photo freight event organized by Jay Wimer of the Goat. The highlight of the day was a triple-headed, [34 car] freight to Cumbres. From there, the train dropped lead engine 487 as well as the flanger. The rest of the train went on out to Osier, where it turned and headed back for Chama. By all accounts, this year's event was a smashing success. The weather was flawless, things ran smoothly (aside from a very minor incident with 488's pilot truck dropping off the rails at Osier), and some spectacular photos have come to light after the event I wasn't able to make it this year, but you can see photos of it in various places on the web - such as William Diehl's excellent photography [here], some shots by Jay himself [#1] , [#2], and [#3], a few by Railstar's Steve Torrico [here], and a few by Carlos Llamas from the cab [here]. For those that didn't get to make it down, there's a video of the event for sale on Chama Steam's website [here]. UP 1989 OVER SOLDIER SUMMIT - PHOTOS! As reported on Saturday, UP 1989 made its first trip to Utah and to the western half of the Rio Grande system. The unit was the third of six units out of Denver, running backwards and behind a grimy UP unit on the point. Last night at Grand Junction, however, the power was wyed and the 1989 lead through the Utah desert and over Soldier Summit. Quinn Clegg just sent me four photos of today's MNYRO-21 crossing Soldier Summit. They're posted [here]. Just as a reminder, 5371 will be coming due for an inspection again shortly. However, this won't be the usual 92-day inspection - the unit is due for its three year (1104-day) inspection. My understanding is that Roper does not perform these, and that the unit will be shipped to North Platte to have the work performed. Since UP has been trying to patch this thing for over a year now, it seems extremely unlikely that it would pass through one of UP's main shops and not get patched. For those who don't remember, the Durango & Silverton route was closed on Friday, 6-Oct-2006, when the first train returning from Silverton discovered a rockslide and water running across the track. Service was suspended north of the Cascade wye while repairs were made, but passengers had the option of taking a shorter trip between Durango and Cascade - much like the usual winter run. The line was cleared some time Monday, with the stranded equipment returning to Durango in one monsterous deadheading move. Everything was returned to normal on Tuesday, 10-Oct-2006, when both regularly scheduled trains ran all the way to Silverton and back. Heads up out west - I just saw on the DRGW list that UP 1989 (the D&RGW heritage SD70ACe) will be headed west on MNYRO-21 on Saturday morning. It's headed to Utah, where it will be paired up with the SP heritage unit (UP 1996) for some work as part of an "Officer on the Train" operation for the next week. In addition to RCLX 8527, the B39-8 that arrived on the San Luis & Rio Grande on 3-Oct-2006, the railroad has acquired a second - RLCX 8524. 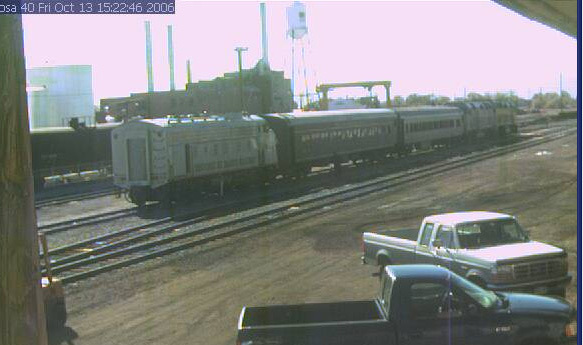 The pair are now frequently seen on the SLRG's webcam in Alamosa, such as in [this image]. After acquiring the FP10 (RPCX 1100) several months back, the unit has sat dead in the Alamosa yard, aside from being moved around a few times. Now the unit will be leaving the railroad - the decision has been made to sell the unit. The unit lacks dynamic brakes, and thus would not be a good candidate as the sole power on a train over La Veta Pass. Reports on Trainorders.com are that the unit will go to the SL&RG's sister road, the Arizona Eastern. (Both roads are owned by Iowa Pacific Holdings.) Contrary to my earlier post, the unit did not leave the railroad on Oct 2 - I mis-read Colorado Zephyr's post on Trainorders. Since the tourist train season ended in the San Luis Valley last weekend, ridership numbers for 2006 are starting to come out. In [this] Alamosa Valley Courier article, SL&RG president Ed Ellis is quoted as saying the ridership on the line was around 10,000 this year, which is roughly what he expected. C&TS total ridership numbers will be slightly above 39,000, roughly a 21% increase over last year, and should be announced in detail soon. For the last few days, there's been a slow-moving weather system over Colorado & Utah, dumping a fair amount of rain on both. On Friday, the storm started pouring on the Durango & Silverton. The first train returning from Silverton that day was lead by DSNG 482. Coming around a curve near milepost 486 (between Elk Park and Needleton) the train hit a rock slide caused by a torrent of water coming off the hillside and over the tracks. They started back towards Silverton, but ran low on water in the engine. Even with DSNG diesel 1 (the Hot Shot) coming to bring them extra water from the fire suppression car, they still didn't make it. The crew eventually had to drop the fire on 482 and wait for 481, off the second train, to drag eveything back up to Silverton. Passengers from both trains were bussed safely back to Durango that night. [This thread] on NGDF has most of the details, as well as a few photos taken by Fritz Klinke of Silverton. Philip Walters has posted a copy of a DSNG press release [here] stating that the railroad has curtailed service above Cascade Canyon (but *is still running that far*) until sometime this week when the slides are cleared and any damage repaired. In the last couple days, photos from a few new trips have been posted to the web. The first two aren't even mine, but are definitely Rio Grande related. The first is Trevor Heath's recent visit to the D&SNG. I can't tell for sure, but it looks to be during the Trains Unlimited photo freight charter late last week. He has it posted on his website [here]. The second DRGW-related trip report to hit the web today is Kevin Morgan's recent trip out to Helper - he's got it divided into three parts on his website (drgw.ws) - [Potash Local, Amtrak, and DRGW 5371], [Summit Colors, Utah Coal, and DRGW 5371], and [Amtrak 6 from Soldier Summit to Dotsero]. There's a new SD70ACe making its way out to the AAR test facility near Pueblo. It's not your normal ACe, however - it's one built for BHP Billiton's iron ore railways, found in the remote Pilbara region of Australia. The EMD press release about the order can be found [here]. Nathan Z. caught the unit - moving as EMDX1001 - up in Denver on Saturday, and let me repost a few of his shots [here]. The Commission has given their approval to next year's fares and schedules for the Cumbres & Toltec. Specifics on dates have not yet announced, but they'll be as normal - likely running from Memorial Day weekend through sometime in mid-October. Fares will rise a bit - 62 for a one way, 76 for a one way with bus return, 115 for a parlor car one way, and 129 for a parlor car with bus return. These compare with this year's prices of 59, 72, 102, and 115 respectively - about a 5% rise in coach fares and a 12% rise in parlor car fares. More details can be found in [this Pueblo Chieftain article].